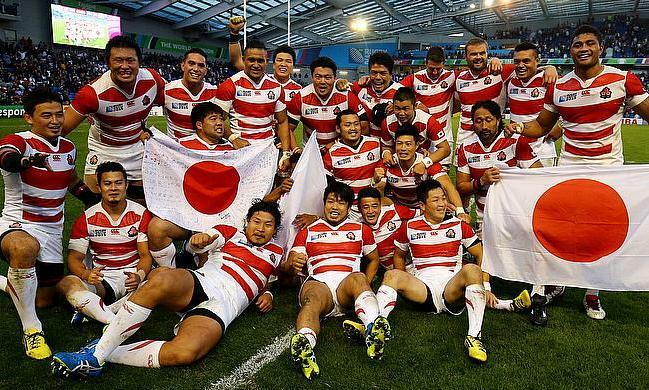 It has been just over two years since Japan shocked the rugby world. Brighton was the setting for the biggest upset in World Cup history as 2015 Pool B favourites, South Africa, faced the spirited Cherry Blossoms with no-one really giving Eddie Jones' team a chance. What unfolded on the south coast was one of the great tournament matches of all time as Japan grabbed a last-gasp win over the Springboks. And with that opening win, came optimism. Japan headed to Gloucester's Kingsholm to take on Scotland, where for 45 minutes, they were very much in the contest. Japanese rugby seemed to be on the up after finishing third in their Pool and the prospect of the World Cup being hosted in their county in 2019 only added to that positivity. The introduction of their franchise, the Sunwolves, into Super Rugby was another step forward, but with the World Cup beginning two years today, Japan still finds itself with work to do. Their results against Ireland in the summer did unfortunately expose their lack of resources but away from the field, there are more pressing matters. This was highlighted on Sunday. Tournament director Alan Gilpin told Kyodo News that Japan are behind on their preparations following a third round of review meetings. Gilpin said: "There are areas where the organising committee has not progressed as much as we would expect by this stage. We have reminded our friends at the organising committee that there is no time to lose with two years to go." Training venues have also not been selected according to Gilpin and his comments are worrying for Japan who await the visit of the top nations for the greatest show in rugby. The greatest show in rugby. That is something we must remember despite Japan being behind in some operational areas such a travel to grounds and infrastructure. The Webb Ellis Trophy was on display at the launch event in Tokyo and with Asia hosting the tournament for the first time; Japan will know doubt be excited for the competition to get underway. When Japan was announced as the host nation, there was always going to be that risk by moving the tournament away from the major countries in the sport, but the possibility it creates for Japan and World Rugby is clear. Rugby is not the most popular sport in Japan, but the World Cup can have such a positive impact on the country by uniting people and getting people involved in the sport. When the tournament was taking place in England, the atmosphere was electric and Japan will want a slice of that. In addition, the prospect of having the All Blacks in their continent, Eddie Jones returning with an exceptionally strong England side as well as hosting the Wallabies, Wales, Ireland etc is something the country will most certainly embrace and a golden opportunity they can't pass up. World Rugby has emphasised this point by stating it will be a special and ground breaking event. But, seemingly there is no time to lose for Japan if this is going to a successful tournament where memories such as Brighton can be created.